Glow it up BLUE and support Autism awareness! We will give you a virtual BLUE out with blue glow, blue lights and effects, and more! Add in several music stations on the course, and a huge post party, and you are sure to have a great time! All participants get a cool shirt, blue glow necklace, and free entry into the post party! ALL 5K FINISHERS ALSO GET OUR CUSTOM BUTTERFLY FINISHER MEDAL!! 1K Begins at 8pm with the 5K at 830pm. The 1K course is completely on property and traffic free so even the little ones can enjoy it! 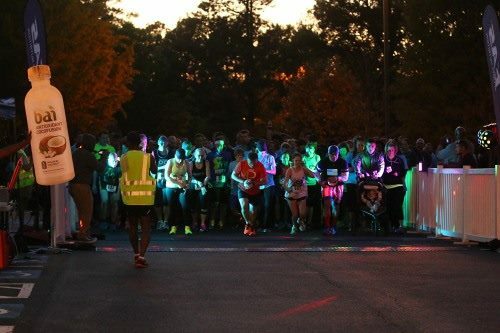 There will be a an on-site pre-party starting at 6pm at the start of the race with food trucks, Kona Ice, a FREE game truck, music, FREE face painting, FREE photography, and more! 2. Saturday 4/13 beginning at 6pm at the start at our official pre-party! FREE face painting, FREE game truck, Kona Ice, music and more! Even if you pick up early at Big Peach, you are still able to come to the pre-party! Plenty of FREE parking on site at Barrett Summit!